Ah, for simpler times, when you'd turn on the TV, flick through the latest Look-In while waiting for the set to warm up, finish off that can of OneCal and settle down to watch Lucinda Prior-Palmer compete in the Horse Of The Year show. No Xboxes or Big Macs for us back then, I can tell you. Though we did have the Wimpy. There was one in Ipswich somewhere between Youngsters and the ABC, and Andy, as a lad, was taken to his local joint in Sheffield. Down in Felixstowe, we'd agreed to meet up at the always reliable Sangha when I spotted it, right there on the high street. Its patty-powered cloaking device temporarily disabled, those lower-case ketchup letters on a mustard backdrop beckoned me in. I texted Andy: C U @ the Wimpy. My my, busy busy within. Fortunate to get a table near the front, though it goes back further than a reminiscing relative. Very friendly girl presented me with a couple of menus: these aren't just menus, they're glossy laminated catalogues of saturated temptation. In a nod to the current day, every item is given a thorough nutritional breakdown. Choices, choices. Meantime, impressive vanilla shake for me, freshly made smoothie for him. Torn between the pork rib and the retro spicy beanburger, I resist the chance to order a "bender in a bun" and go with the Club & Chips. That'll be 907 calories of bacon, egg, cheese, burger and lettuce (the goodness) in a layered toasted sandwich. Less of a sandwich, more of a manwich. Doesn't this section include the term "light lunch"? Not today, my friend. Some foodstuffs hit the spot; this plateful (distressing metaphor alert) clubbed it like a baby seal. No toasted teacake necessary, no sir. 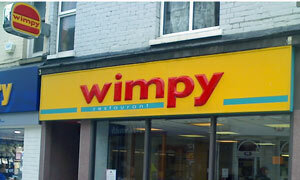 I see from the Wimpy website (really) that Norfolk has a solitary site while Suffolk boasts five of the fellas. Find one and feed your face like it's the 50s. If it was a car -- Armstrong Siddeley Sapphire. If they were passing by -- Mark Kermode.